Bus from Kuala Lumpur to Muadzam Shah is the most convenient and important bus service especially for students. That is because Muadzam Shah is a town known as a fully established educational centre with quality higher academic institutions such as university and polytechnic. Many students and working adults rely on this bus services to Muadzam Shah for study and work. Sepakat Liner Express is the one and only bus company offering bus service from Kuala Lumpur to Muadzam Shah. Sepakat Liner is a reputable bus company recognized as prioritizing customers satisfaction and its service quality. Sepakat Liner Express offers up to 6 daily departures. The first departure starts at morning 11.00am. The following schedules are 5.45pm and 9.30pm. They operate the bus route with comfortable VIP coach fleet so that passengers can enjoy the journey. 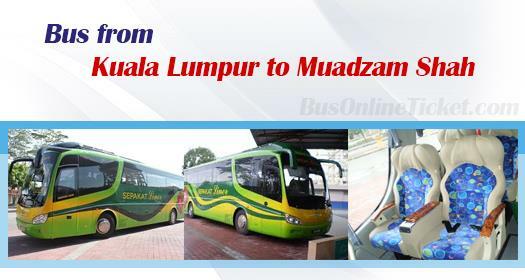 The estimated duration for bus from Kuala Lumpur to Muadzam Shah is about 4.5 hours. Washroom break will be provided upon request to driver during the journey. The bus fare is fairly charged at affordable price from RM 22.80 – RM 38.30. The departure point for bus from Kuala Lumpur to Muadzam Shah is located at is at Terminal Bersepadu Selatan (TBS). Passengers can easily access to TBS by taking public bus, taxi, KTM or LRT. The arrival point at Muadzam Shah is located at Terminal Bus Muadzam Shah, the transport hub in Muadzam Shah. Don't be tardy! Book your bus ticket online now from our official website BusOnlineTicket.com or via mobile app which can be downloaded for free on App Store or Google Play just a fingertip away. Kuala Lumpur to Muadzam Shah bus ticket could possibly be sold out, especially during back-to-school and peak season.